It’s been a long day of hiking and you’re exhausted. You set up your tent and are eagerly waiting for dinner to cook, counting the minutes between the noodles and your mouth. You plop yourself down on a log to just sit there and wait, watching the sunset change the sky from blood-orange red to cotton candy pink across the horizon. Well, how about a few minutes of thru-hiker yoga? 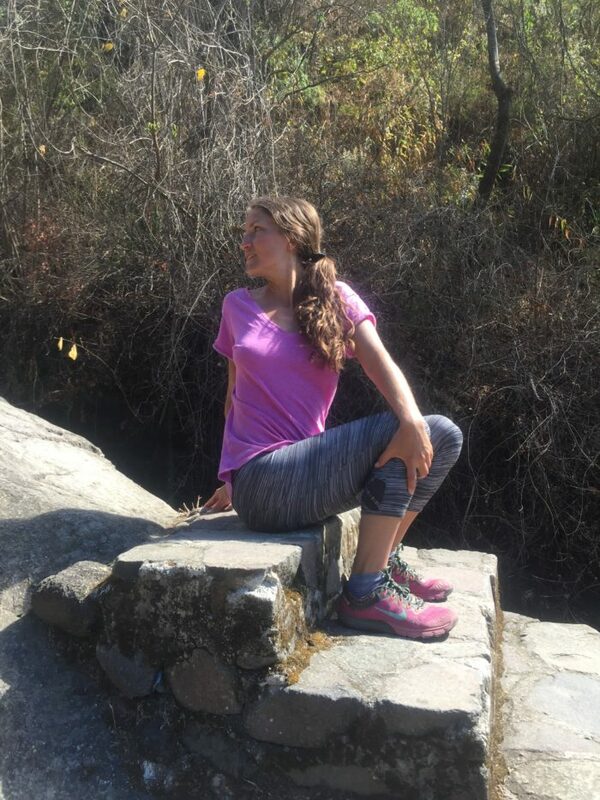 Thru-hiker yoga? Skepticism and resistance abound. What does that look like, you wonder with a raised eyebrow? First, in order to convince you to give it a try, I’ll tell you I know it needs to be easy with minimal effort. That’s why I call it thru-hiker yoga. For as determined and focused as we are to get where we’re going, we can also be as lazy as f**k when we aren’t walking. In a world where even blowing up a sleeping pad requires too much work, yoga can’t be another daunting chore to add to the mix. I get you and am with you on this. 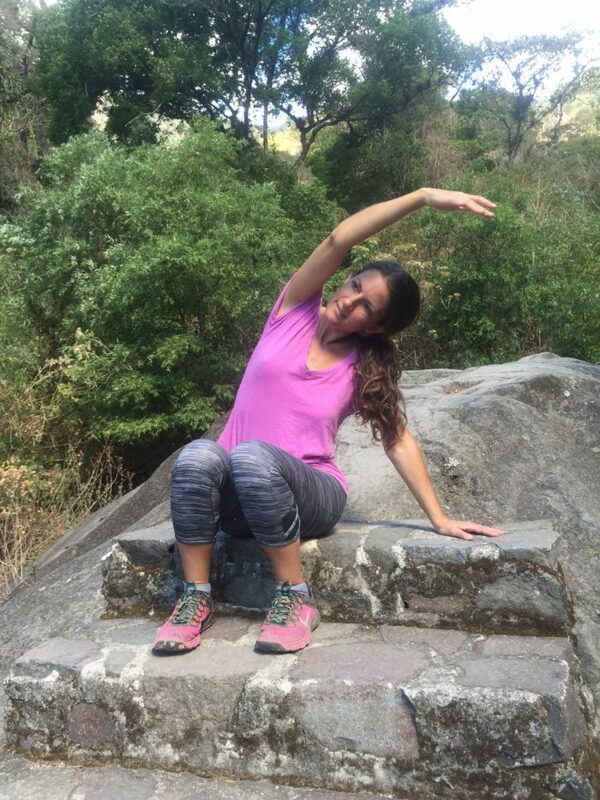 On all of the long-distance hikes I’ve walked, I’ve always taken some time to stretch with some yoga postures, every day. I truly believe this is why I’ve essentially been injury-free while hiking. 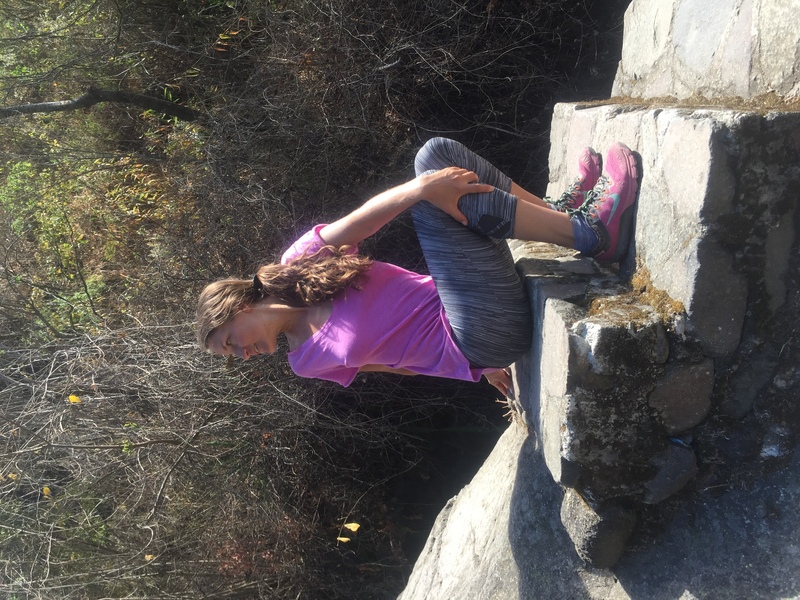 Hamstrings, hip flexors, shoulders, and low back are constantly at work while we hike, so showing them a little love each day makes a world of difference to minimize the risk of injury. Thru-hiking is kind of torture on the body, day in and day out. Giving yourself the chance to do a few simple poses to breathe fully and stretch is simply delicious. You’ll feel so damn good with the pick-me-up, there’s a chance you’ll get addicted and want more. Yep, Yoga Dealer they call me. Wanna try? 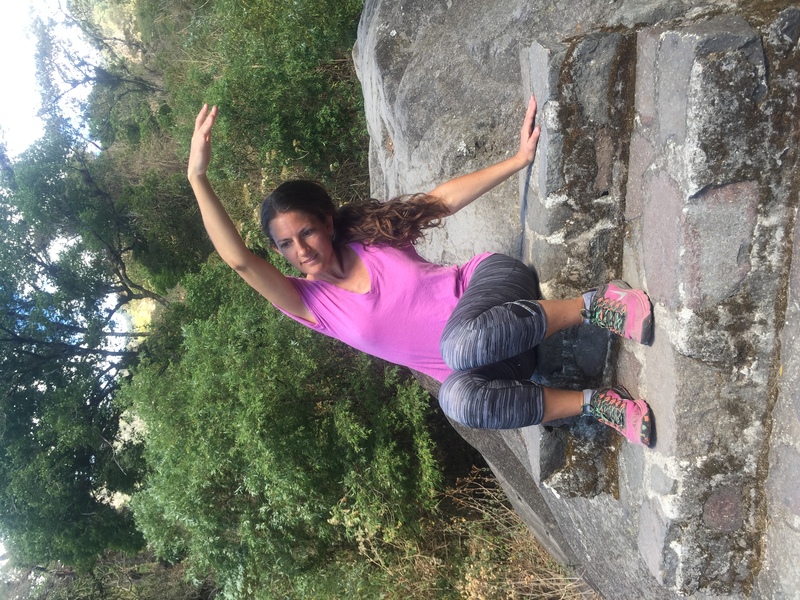 Here are four easy yoga poses in a sequence modeled by my beautiful friend Dani that you can try out on your next break. You could also opt to do just one or two; you can’t go wrong here. Find a rock, log, or the ground to sit on. Start with reaching the right arm alongside the ear as you place the left hand on the ground. Inhale and stretch to the left side. Hold for five to ten breaths and switch sides. *Opens up the intercostal muscles and side body, which can get cramped as we hike. 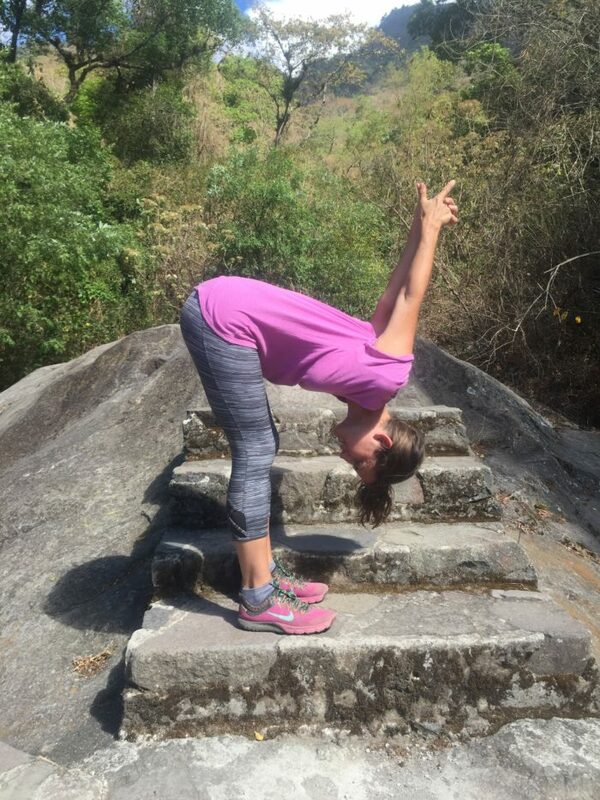 *Side bends bring balance to your entire body. They lengthen the abdominal muscles, hips, and thigh muscles, while improving flexibility in the spine. These muscles can get short and tight as we bang out miles. 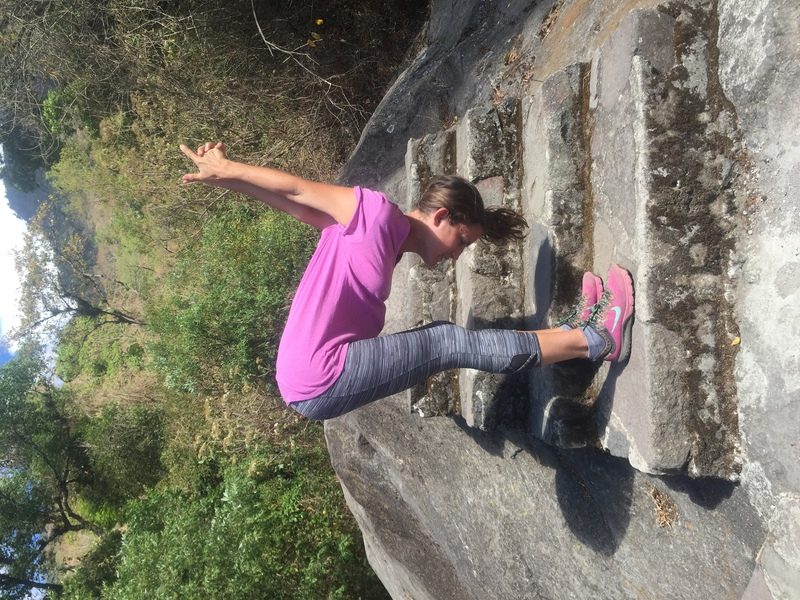 From the side bend pose, come back to neutral and then place the left hand above or below the right knee. Place the right hand behind your back and reach tall to lift your spine as you inhale. Exhale as you twist. Hold for five to ten breaths and switch sides. *Squeezes out stale wastes such as old blood, lymph, and toxins that get stuck in the intervertebral discs. When you untwist you get flooded with new, fresh supplies. *Elongates the spinal column and is an excellent aide for back-care well-being. *Twists are detoxifying and support cleansing. We all know as hiker trash we can use as much cleansing as we can get. After twisting on both sides, return to center. Place both hands on your low back with your fingers pointed up. 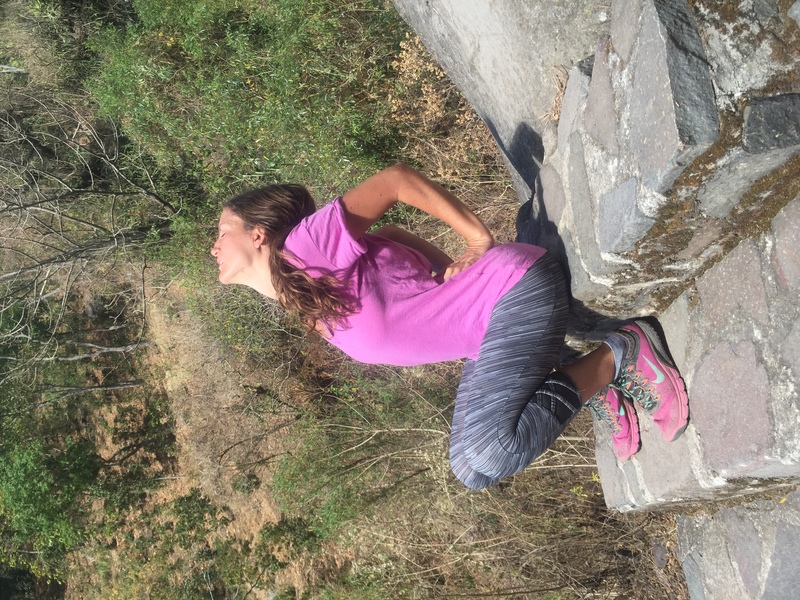 Use your hands to support and lift your spine as you arch into a gentle back bend. Hold for five to ten breaths and then come out of the pose. *When carrying a pack, you spend a lot of time hunched forward, and this posture stretches you out in the opposite direction. *Back bending increases the production of synovial fluid, which keeps the joints lubricated. *Back bending opens up the chest which energetically helps to diminish sadness or depression (in case you are having a bad day on trail). Stand up and place your feet about hip width apart. Keep your knees slightly bent (or bend a lot if you have very tight hamstrings) and fold forward toward the ground. You can let your arms dangle, or interlace your fingers behind your back and stretch your arms over your head for a shoulder stretch. Hold for five to ten breaths at least. *Ultimate love for the hamstrings here, and this is a muscle group we work hella hard while thru-hiking. *It’s a good massage for the abdominal organs when you forward fold, and lord knows what we put those through while on trail. *This pose also acts as an inversion posture, because the head is lower than the heart. With the pressure of blood within your body reversed, you’ll experience lower blood pressure, a slower heart rate and a pleasant sense of calm and well-being, all without having to overexert yourself. Basically, this is stress relief for the mind as you send a fresh blood supply to the brain, while also offering some physical relief from back pain. Win-win overall. Since this posture is both a forward fold and an inversion, you’ve combined two of the five pose categories to have a complete yoga practice. Yes, I made it even easier for you with just four poses instead of five. Thru-hiker yoga is done, you feel refreshed, and dinner awaits. Get moving in your tent, y’all! The above sequence is just one example of all the varied possibilities you could get creative with outside, but why not stretch in your tent? Hug your knees into your chest to release your low back. Try lowering your knees to one side for a reclining spinal twist. Flip over onto your belly, prop up on your forearms, and arch your back slightly into a sphinx pose. Stretch back into a soothing child’s pose with your knees wide, which is medicine for the spine and opens the hips. Try not to think about it too much, but instead listen to what your body tells you would feel downright amazing. Then give it a try. I promise, your body will reward you for this gift. Thru-hiker yoga. Coming soon to a trail near you. This is great and super helpful! Any suggestions for an Inversion post? Hi Weasel! The standing forward fold actually can work as an inversion because the head is lower than the heart. If you want to elevate your feet though, you can do something like ‘Legs up a Tree’ pose, where you lay on your back with your legs up in the air against a tree. This is great for draining stale wastes and toxins from the feet, especially since we walk so much. It also helps reduce inflammation and swelling in the feet and legs. Good luck! So stoked on this post! Thank you. Are you bringing any sort of pad/mat? Hi Leah! I won’t have a yoga mat with me, because of the added weight. For tent yoga I just lay on my Therm-a-Rest, and otherwise I just sit in the ground or stand outside. I like the Short and Brief aspect, I was attempting these while reading this article and I believe I will attempt to fit it in my day. Thanks for the inspiration Daya.